Photo by Jonathan Hession ©2013 HISTORY®. All Rights Reserved. Katheryn Winnick, Travis Fimmel, Ruby O'Leary, Nathan O’Toole. Photo by Jonathan Hession ©2013 HISTORY®. All Rights Reserved. 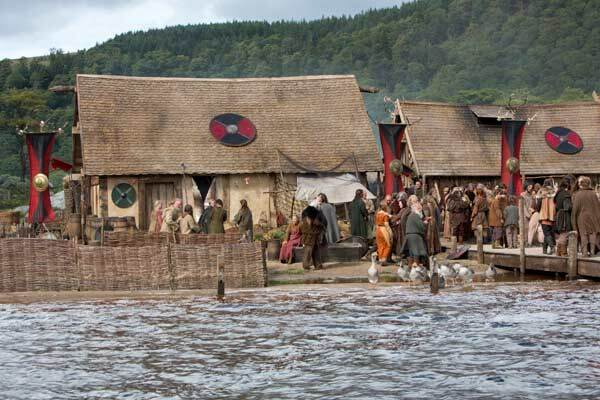 Elements of this Viking village were sourced globally…check the article for fascinating details! Katheryn Winnick. Photo by Jonathan Hession ©2013 HISTORY®. All Rights Reserved. 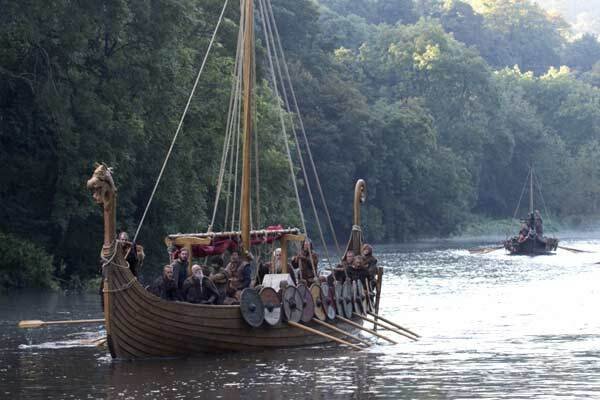 The deep hull consists of a strong central plank and overlapping strakes, helping the boat glide silently over the waves...the high mast can be dismantled for storage, storm or stealth..
As they row, Viking raiders store their shields on the side of the boat, adding to the vessel's unique look. George Blagden. Photo by Jonathan Hession ©2013 HISTORY®. All Rights Reserved. Travis Fimmel, Gabriel Byrne, Jessalyn Gilsig. Photo by Jonathan Hession ©2013 HISTORY®. All Rights Reserved. Jessalyn Gilsig, Elinor Crawley. Photo by Jonathan Hession ©2013 HISTORY®. All Rights Reserved. 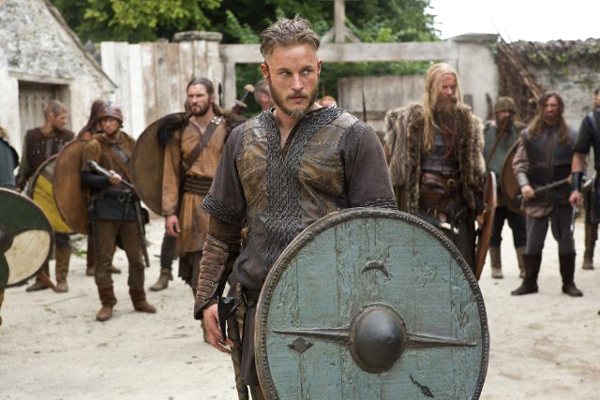 Clive Standen, Katheryn Winnick, Travis Fimmel, Ruby O'Leary, Nathan O’Toole. Photo by Jonathan Hession ©2013 HISTORY®. All Rights Reserved. 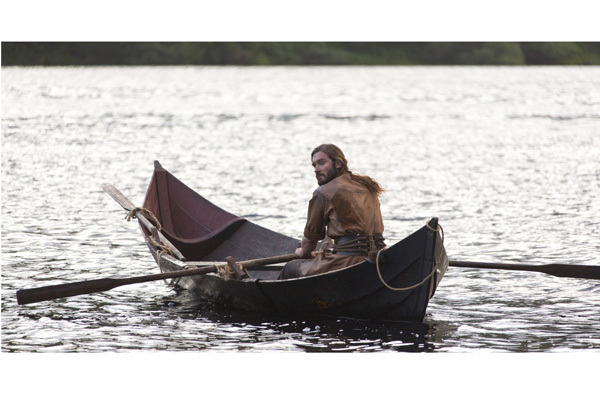 The tents used throughout the series were made in-house, to Viking specifications! The shield maidens were fierce warriors. 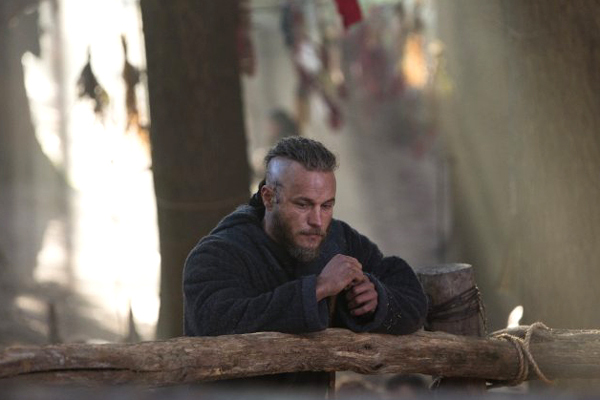 Note the background color is the same for the Lothbrok family shields, but each design is individual. Obviously, historical accuracy whenever possible would be a mandate for a series on the HISTORY® channel! But how much actual visual reference to the 8th century Vikings exists and is accessible? 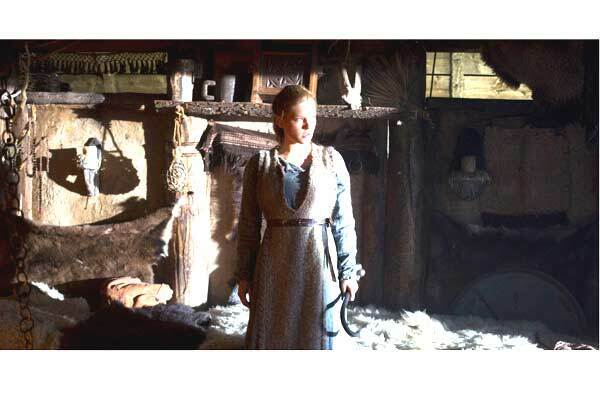 Set Decorator Jil Turner SDSA: There is very little visual reference left today from when our Viking story is set, around 796 A.D., except for a limited number of artifacts that have been discovered from archeological digs. Metal work survived the best, so historians have been able to piece together what a typical Viking sword looked like, in terms of the cross-guard, pommel and length of blade that the Vikings used. The standard supposition of Viking horns on helmets turns out to be incorrect...those horned head coverings did not exist except as a figment of a more modern illustrator's imagination. 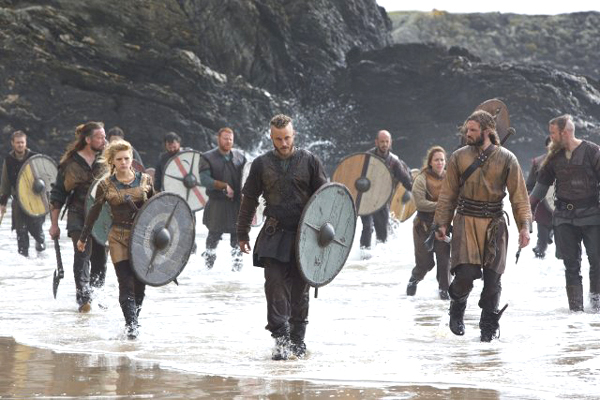 The Vikings are actually recorded as being a tribal force that wielded axes and dressed in animal skins and furs. Unfortunately, when it came to things such as fabrics, the only evidence that was available were tiny scraps of cloth found in their beautiful jewelry, such as decorative brooches. So we used various guides to establish our visual reference. 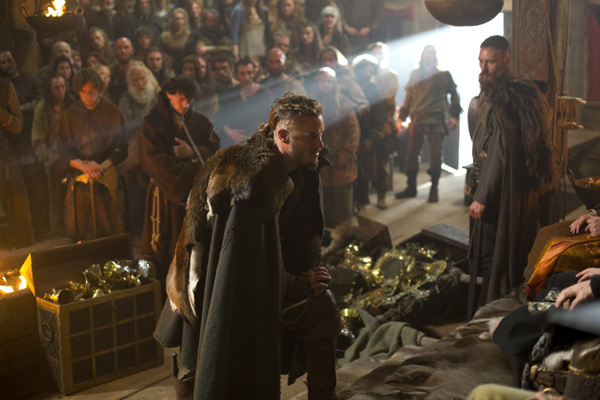 For example, it is well documented that Vikings gathered in a communal Great Hall. This helped us create an interior village atmosphere where the fire was the focal point of most activities. For me, this factual fireplace feature always had to be taken into consideration when dressing the interior sets. The central fireplace, which on one hand looked fantastic, on the other hand limited and dictated the orientation and flow of the furniture...which forced me to think outside the box when we had so many interiors to complete. The big question was how to make each interior set look different, when generally each set had the same layout with the rectangular fireplace slap bang in the middle. I tried to imagine a little of their private life, with or without family and children, and what they liked to do...and I gave a trade to each character who lived in that house. For instance, Eric [Vladiir Kulich], I decided was a fur trader. An older Viking, his kids had grown up and left home, so I put in lots of pelts and skins, few personal pieces. 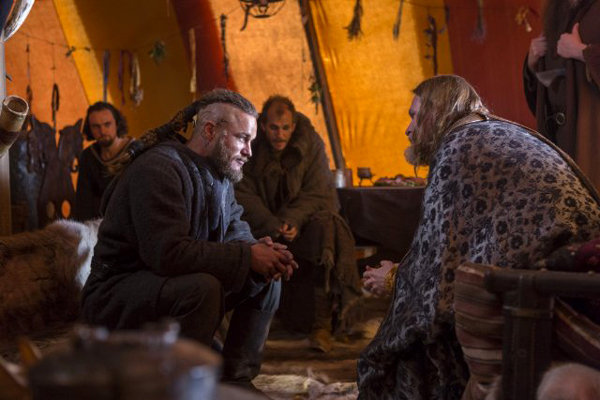 Floki [Gustaf Skarsgård], we know from the script, is a boat builder and has a bit of a shaman in him. His house was one of my favorites to dress. We built his bed and table in the shape of a boat. Because of his fascination with trees and wood, I had a huge tree hanging upside down so all that was visible were the gnarled roots. 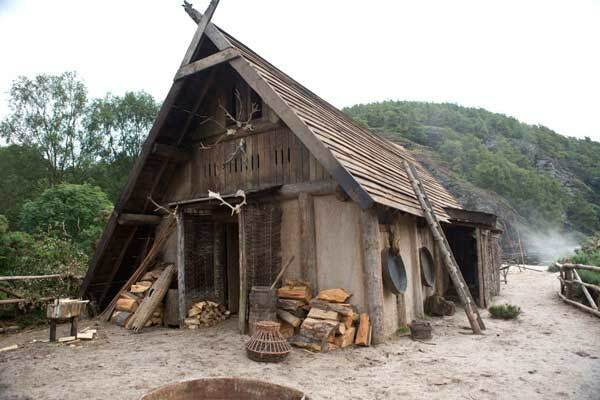 Another key factor that is well documented was the fact that there were no windows in Viking homes. This made the practical lighting aspect essential...and a challenge! I tried to blend in my lighting, using natural tree stumps and branches, or deer and cow horns, to hold tallow candles in the more domestic interiors, to the other extreme of using 21-inch woks as fire bowls on chains hanging from the open mouths of carved and cast dragons in the Great Hall and other large scale sets. The effect I hoped these would create was that they were breathing fire on all below…that it would give a sense of power. What were some of your other key points or elements to create a realistic portrayal? Although the Vikings were sophisticated in many ways, the objects they possessed were few. They were functional rather than stylish and were very well used. We tried to bridge the balance of function and style by introducing some decorative elements. For example, we used the revered horse's head as a subtle motif in various places, such as finials on our lighting. What did you particularly add in, to widen our scope of awareness about the Vikings’ way of life? They were very family-oriented and so we tried to create a 'cozy' atmosphere in the interiors, where possible. This we did with the use of candles, furs, soft fabrics and woven pieces, to indicate both family warmth and a practical warmth emanating from the elements. How did you go about physically re-creating the period and cultures? 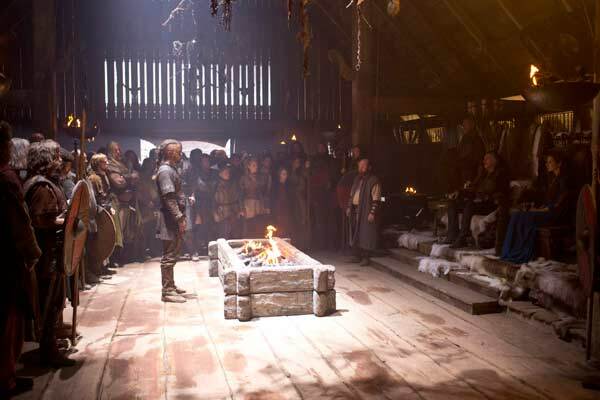 When Production Designer Tom Conroy asked me to be the set decorator on VIKINGS, I was delighted with the prospect of helping bring this project to life. 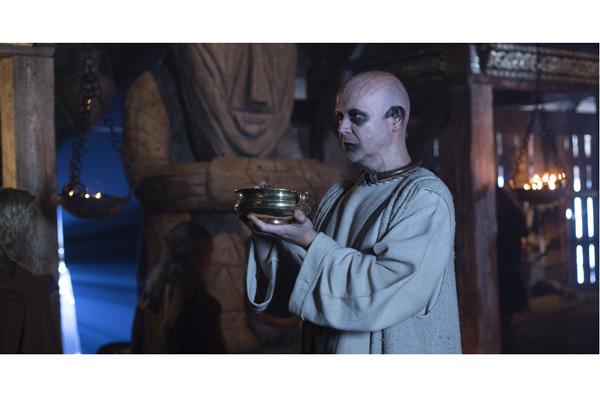 After I initially visited the UK prop hire companies…we film the series in Ireland…I soon discovered that there few relevant props or dressing to hire for our Viking period. I always knew there would a large amount of prop making, but I never realized just how much we would have to make from scratch. From iron nails, studs, rings and hooks, to our very own Viking round linked chain that is now evident on all the sets. Soon I was sourcing from all around the globe. First we commissioned eight 40ft containers from India filled with furniture, fabrics, leathers, skins, hardware and smalls including household everyday objects such as plates, beakers and cutlery. Special bespoke commissioned pieces such as the Great Hall thrones were designed in-house and then made later in India. Other decorative features, such as dragon heads were modeled and cast in-house in our studio prop making workshops. We had 140 pipe-shaped oak barrels made in Serbia to our specification as there were only Victorian-shaped examples available to hire. We sourced and bought from all over Europe hundreds of skulls and antlers…from deer, elk, sheep and horse to tiny bird-sized skulls. Reindeer skins were sourced and purchased from Scandinavia, sheep skins from an organic tannery in England. Saxon 'golden loot' was sourced from Roman and English prop houses. Candles were commissioned from Spain to our color specifications. Wattle fencing came from Poland, poles from India and a talented local Irish blacksmith made hanging griddles for our forges and fires that are included in almost every set. What supplies or methods were/are you able to use that were as if from that time? What modern supplies or methods were you able to use that you were thankful to have instead! Ah! Well...Resin and the ability to cast props…Fabric dying on a large scale…Metal armature frames for tents…Power tools…Waterproof boots and good rain gear! One of the first major decisions I had to make for the show was the Viking shield. I knew how important it was, and I was desperate to get it right. Once I had our first director Johan Renck’s approval, I settled on a 30-inch round planked shield with various metal work around the rim and across the front. To show that they had been in battle before, I had metal work attached randomly as if they had been repaired after each battle by its owner. Then there was the question of colors and designs for each shield. Each raider’s shield is unique, painted in different colors, patterns and motifs. My assistant decorator Aine Smith and I set about trying to create a color tone and mood for all the shields. We went for a muted color range with not too much Celtic design incorporated. I felt that they would be very distracting considering that they were so large and would feature so heavily on the show. So we designed 250 shields in different colors and patterns…quite labor intensive, as you can imagine. We did have certain characters linked. 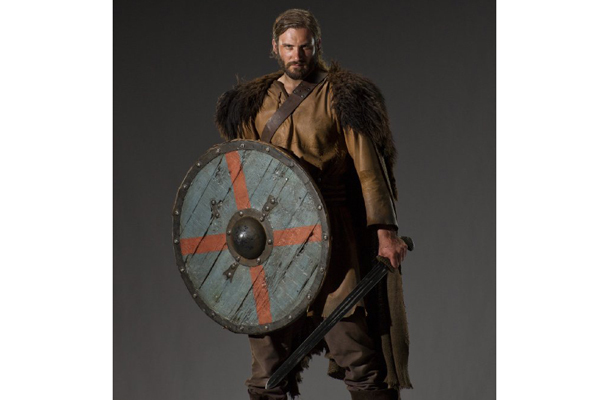 For instance in the first 4 or 5 episodes, Ragnar [Travis Fimmel] had a teal blue shield with a small arrowhead painted on it…his brother Rollo [Clive Standen] had a shield in the same color but with an orange x across it, but he also had the arrow motif. 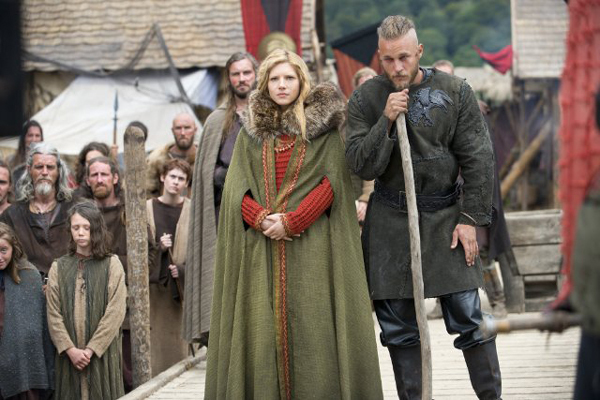 Lagertha [Katheryn Winnick], Ragnar’s wife and a shield maiden, has a shield in the same color with a subtle tracery design around the central boss. This way they were all slightly different, but in keeping them in the same basic color, it subliminally told the audience that they were family. These were pieces that our talented prop makers made for me. The sun board we researched heavily, and came up with a good basic design for this floating compass, one that we hoped would be close to what the original looked like. The sun stone was more of a challenge, as it had to project a lighting aspect that we could not achieve naturally to camera. We bought some plagioclase feldspar and inserted a special light inside that we could activate when Ragnar held it up to the sun. 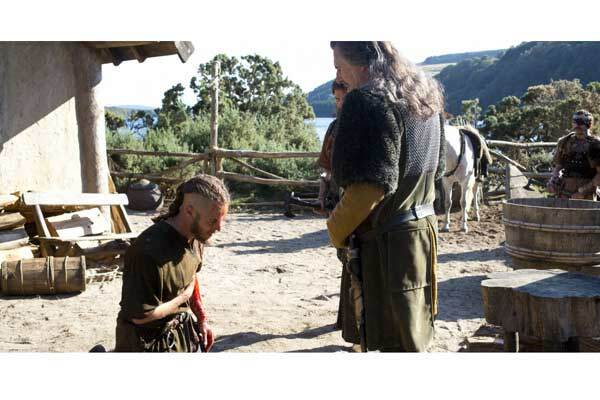 What differences were manifested in the sets of the other countries the Vikings raided/visited…other cultures? We took some artistic license with flags, as they didn't really exist at that time. But I felt it was important for Earl Haraldson, played by Gabriel Byrne, to be seen as all powerful in his world...that he commanded respect and fear. He had house carls with him for protection at all times. 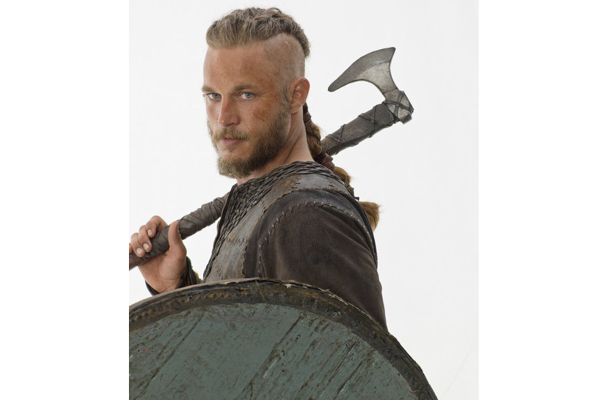 His character was the only Viking I assigned a uniform color to, for his men’s shields and also his banners. We decided on a strong deep red and black for the empirical earl. For the Northumbrian King Aelle [Ivan Kaye], I chose a deep burgundy banner emblazoned with an early Christian cross. This I hoped would show that the Saxons had left their own pagan gods behind and had now become "god-fearing" Christians, who also feared any tribe who did not worship their god. Anglo Saxons had the Roman influence. They were a seemingly more cultivated and orderly society, with good farming land and methods. Vikings were pagans and worshiped their Norse gods, for example, Thor the God of Thunder. Unveiling this pagan aspect was and is essential to a true depiction of their culture...I completely embraced our weaving it in throughout the series...and I thought it brought another dimension, a new understanding as to why they showed no fear and embraced death. 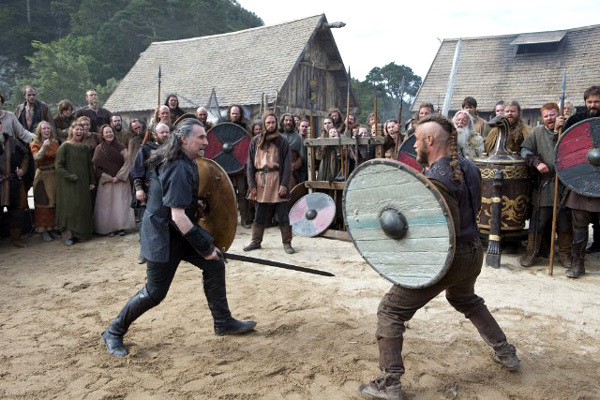 Another fundamental difference is that the Vikings were a more equal society than the Saxons. Women commanded and received more respect…shield maidens, skilled female warriors, fought side by side with their men. 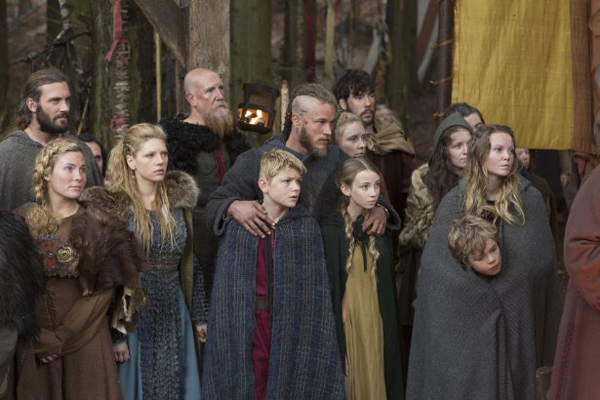 Many Viking decisions were made, and actions taken, in a more communal way. All Viking warriors swear allegiance to their earl as their local chieftain. 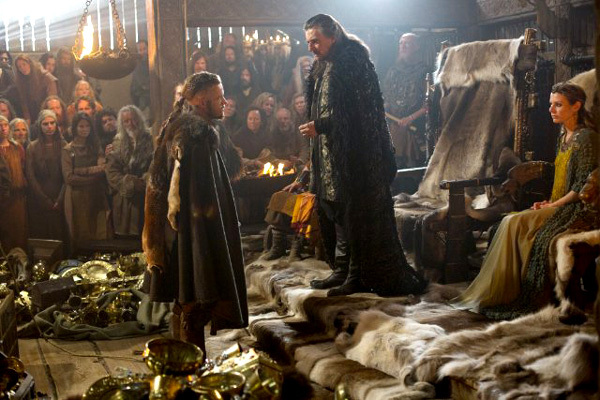 I felt Earl Haraldson needed something special beside his throne, so on a low table, sits his quaffer/chalice. I had a pig’s skull adapted as a stand to hold his drinking horn. 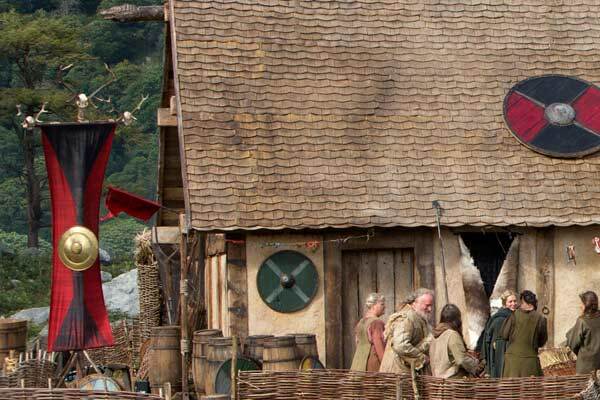 There are many symbols of their worship of the Norse gods and their direct ties to nature, from the carved thrones and other carvings to the fire bowls, but the strongest symbol is an upside-down tree suspended from the rafters. We hung lots of bones and fabrics from it as if the people in the village had made offerings to the gods. 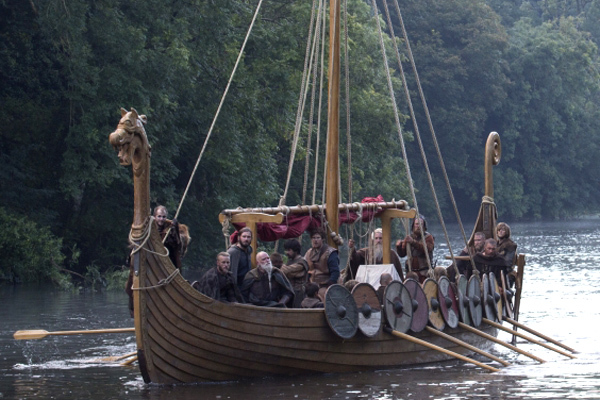 For the Vikings, the sea is as much a part of their daily life as the land. It is a source of life and sustenance. 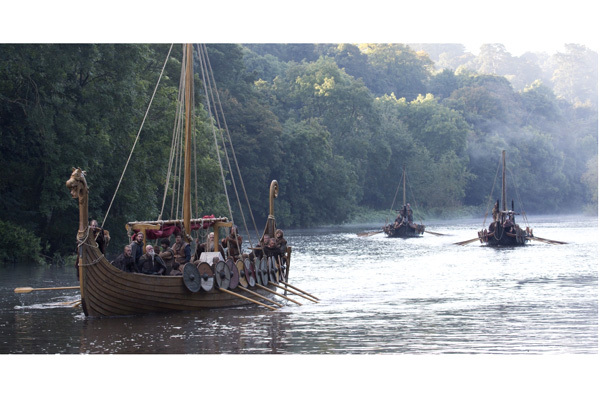 Trading with other cultures…and sometimes raiding them…meant that a life around boats and water was a foundation of Viking life. Fishing, curing fish and meat for the long cold winter, blacksmithing and boatbuilding were essential. With a short growing season and harsh soils & climate, farming was difficult, but prestigious. Of course, the highest prestige was the warrior-raider, not only for the safety of the village and family, but also for the possible plunder that might be shared. 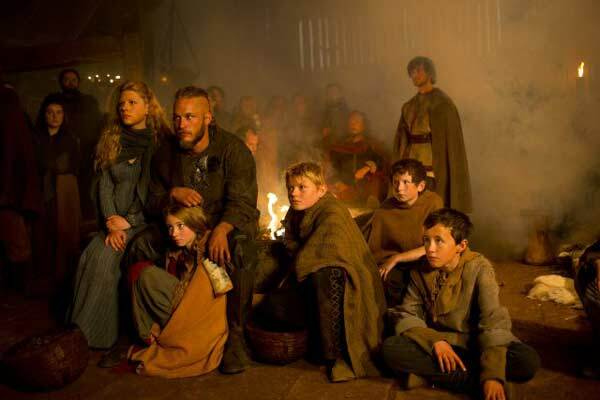 The Lothbrok home offers a window into life of the Viking farmer-sailor-warrior, in this case Ragnar and Lagertha, and their family. One of the most defining elements is Lagertha’s loom. She could have made the sail for Ragnar’s boat at home on her loom over a winter. All the family’s clothes would have been made from a standing/leaning loom such as hers. We personalized their home with decorative-but-functional objects…we discovered many interesting ways to use horn and antler and branches, materials more likely to be available to them. Always, there were visual references to their gods. And since family was of vast importance to them, we added a just few smaller things to denote the parents’ love for their children. The fireplace was the soul of their home. They ate, slept, cooked, talked, argued and then made up all around the fireplace and it was a huge focal point in their house. For the farm aspect, we had rudimentary tools and serviceable pieces made. Then, of course, there were the animals! Goats, pigs, geese, chickens and ducks…animals for milking and meat, skins, feathers, bones…all useful and never wasted. We made all our tents from scratch with our wonderful drapes team, led by our head draper Sharon Dunne. I think we made about 15 in total. Their simple design, which was based on historical records, made them easy to move around to camera. A bonus! I overlaid Viking-style fabrics on top to create some color. In the monastery Lindisfarne, and the Anglo Saxon sets in general, I tried to show the contrast of the different cultures through the furnishings, fabrics and food. 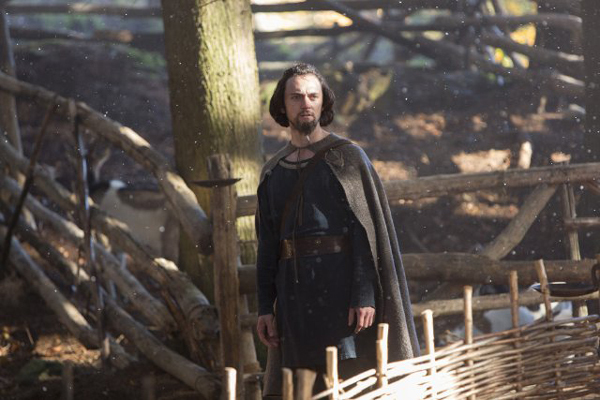 For instance, I commissioned two types of bread…Viking flat bread and a more rustic oval-shaped loaf for the Saxons. I used different fabrics for each culture, and tried to make the Saxons more ordered than their Viking counterparts. These subtle details I felt would subliminally help the audience believe the clash of cultures. The monastery set is as stark as it is orderly and structured. It shows a clearly settled and organized group that pray to a different god. 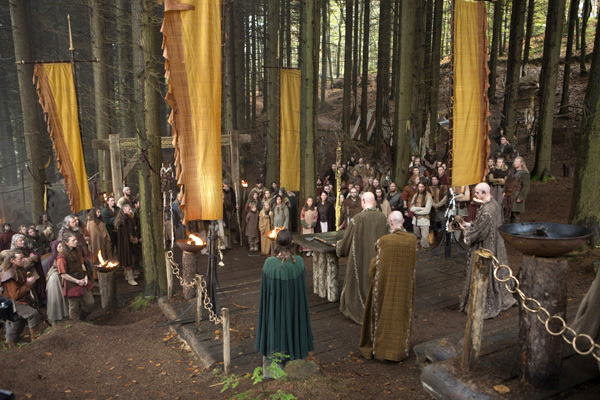 When the Vikings land, they appear to be more brutish and wild, while the monks are ordered in their setting. This manifests itself through the repetition of elements in their work area, dormitory area, the bedding, the lighting and their seating/dining hall. Even the very fact that they could write was astounding to the Vikings! I was always aware that the Vikings came from chilly Scandinavia, so I used predominately reindeer and bear skins in their sets. The Saxons, on the other hand, had more fertile land, which made them better equipped for grazing animals. Sheep skins suited them the best and I tried to be faithful where possible to the period by choosing the breeds Soya, Suffolk-crosses and Jacobs sheep which all had wonderful two-toned coats. 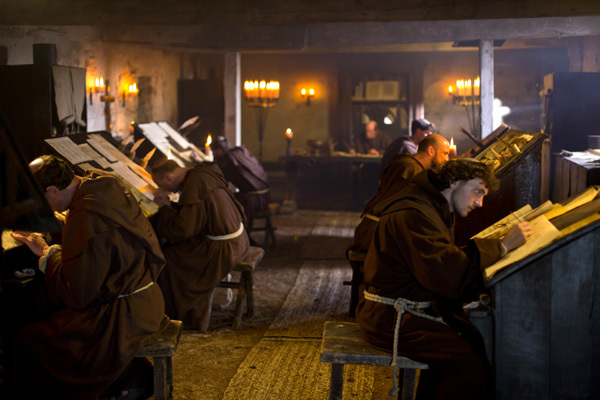 The monk Athelstan's illuminated gospel was a hero prop, so I commissioned seven leather bound versions of the gospels from a traditional bookbinder in County Kerry, Ireland. These were done in three stages to reflect the varying time spans of our story. 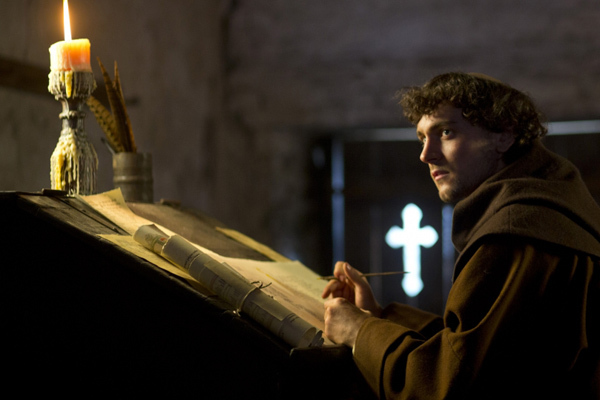 When we first see the Book of Gospels, Athelstan [George Blagden] has smuggled it from the monastery in near perfect condition. In the very last stage, he retrieves the book from under the floorboards and it disintegrates in his hands. I had commissioned seven copies, as our actors were generally always close to water and I was certain that we would lose some to the sea! Luckily this never came to pass, but I felt safe knowing we had spares. 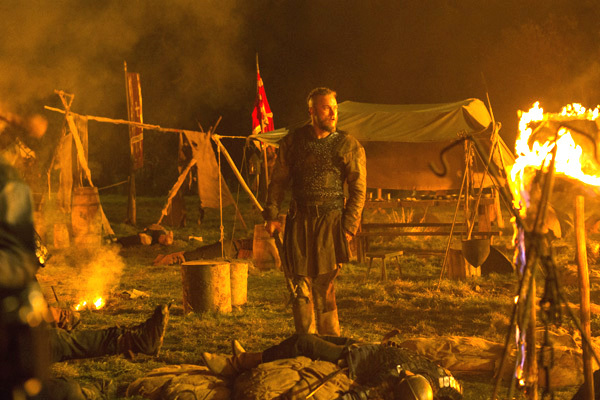 As I alluded to earlier, the pagan aspect of Viking culture has always intrigued me and when I read Episode 8, I was enthralled with Michael Hirst's powerful script. I could immediately visualize and was excited with the prospect of re-creating such a temple and its surroundings. The choice of the very fitting location that Tom selected was inspirational and lent itself to the ethereal atmosphere that we all wanted to create. The initial key elements for me were the tall golden temple flags that gave the set its sense of occasion and scale. I was very aware that the enormous physical area the forest covered would be a huge challenge, yet I felt the large golden flags would be magical in this setting, as they both blended in with the landscape and framed the set. The still and sheltered atmosphere of the forest and the steep physical incline of the location really lent itself to the emotional charge of this human sacrificial scene. The sacrificial altar was also a key prop for the story. This was originally a Naga table sourced from India that had all the right ingredients including a beautiful patina, but unfortunately it was a very low table. I adapted it, realizing that beautiful trees serving as legs were the only solution. In the process, I drove my buyer a little crazy trying to source the right trees. I do feel it was worth it, as it gave the altar its rightful stature. The table top was then customized with four dug out grooves configured in a diamond shape that would let the blood merge and drain to a central point. The nine entrance gates that were created followed through the Viking symbolism of the number 9. I created nine sets of animal pens that each held nine sacrificial animals, except for the last pen that held nine sacrificial human beings! Today this is a hugely emotional and unacceptable concept, but for the Viking culture it was the rarest of privileges to be chosen as the sacrifice to reach Valhalla. We hopefully achieved this with the mood of the location…and I hope the props and set dressing helped give the actors the right tools to feel as though they were close to entering Valhalla. You mentioned the phenomenal location. Please tell us about filming on location for this series! Filming on location is hard, as we all know. Filming 70% of the show on location is extremely tough going on the dressing crew. Many of our locations were practically inaccessible, and we had to build roads to access a lot of them. 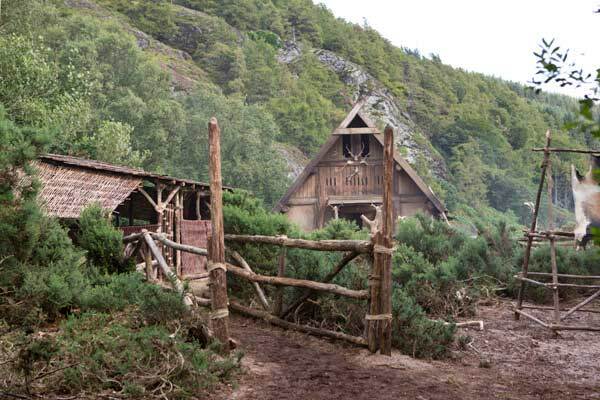 For instance, the main village of Kattegat is filmed in a place called Luggala, in the Wicklow Mountains of Ireland…a beautiful and worthwhile location, but we had to tractor and trailer in every single piece of dressing! No mean feat, it took 5 weeks for our wonderful prop master Paul Hedges to get in every last pole, fence, boat, barrel, cart, et al. The Temple at Uppsala set was another difficult location…a huge forest situated on a giant hill…and our Temple set was…yes, you’ve guessed it, right at the top of the hill. I believe I euphemistically referred to it earlier as a “steep physical incline”. Every single piece of dressing was manhandled up that hill. No quads or trucks could do it. So as you can imagine, we were glad it didn’t rain while we were dressing, as it was one of the last sets that we filmed around the end of October/early November. I have worked many times with Tom over the last 8 or 9 years. We both did all four seasons of THE TUDORS, as well as both of the television series CAMELOT and TITANIC. I think that is a total of 62 episodes, not including the VIKINGS series, Seasons 1 and 2! Obviously, we embrace the challenges and have great respect for each other. I have been lucky to have been working with the same crew on nearly all these projects, and have been particularly fortunate to have my prop master Paul Hedges, main set dresser Dave Wallace and buyer Anna Kirwan…who are all very supportive and talented…with me on these amazing shows. 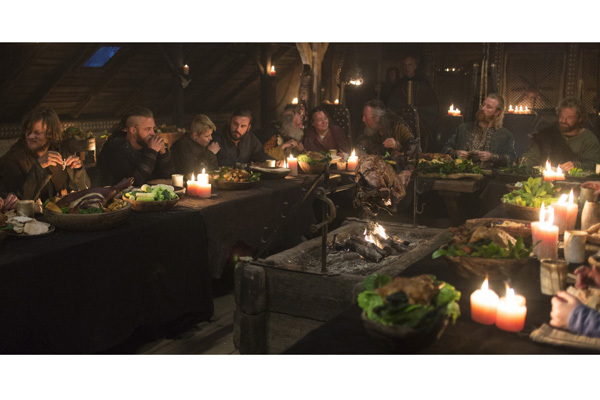 I am a great believer in a team effort, and I think it’s very important that everybody working in the set decorating department all pull together and enjoy what we are trying to create…which at this moment, is the next season of VIKINGS!